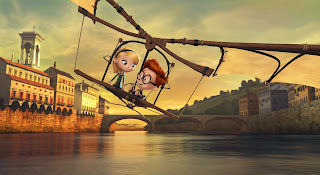 There's a scene in Mr. Peabody & Sherman in which Sherman wants to fly a Leondardo DaVinci machine, but he's sure, though, that he hasn't the ability to do so, since Mr. Peabody has told him as much on many occasions. That voice is in his head, paralyzing Sherman even as he finds himself in the sky, plummeting to his certain death, while he repeats what he's heard so many times, "I can't fly." Until he does; he flies. Then Mr. Sherman calls up to him, afraid, of course, "But you can't fly, Sherman!" And all of a sudden, Sherman can no longer fly. This is my favorite scene for what it tells us about what fear and lack of confidence in both ourselves and others who look up to us can do. So, to myself and my son, I say, "You can do it - whatever it is."